At its meeting on April 10, 2019, the Metrolinx Board of Directors approved changes to GO Transit fares effective April 20, 2019. Learn more. Your GO Fare is based on whether you’re an adult, senior, or student and the distance you’re travelling between two specified points called fare zones. Children 12 and under can travel on GO Transit for free. To pay your fare, you can buy a ticket or pass or use your PRESTO card. You use the same ticket or pass whether you take a GO train, a GO bus, or a combination of both for your trip. You can calculate the fare for your trip here. You can buy tickets, group passes, and day passes at the ticket counter or ticket vending machine at your station. 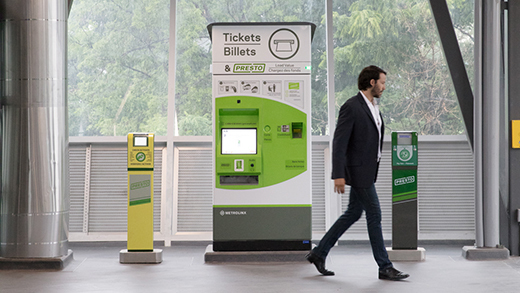 Buy or load your PRESTO card at any GO or UP Express ticket counter, at select ticket vending machines across our system, PRESTO Self-Serve Reload machines, online at prestocard.ca, at customer service outlets, and at select Shoppers Drug Mart locations. You can learn more about PRESTO here. Tap your PRESTO card before you board the train or bus and be sure to tap off. Learn about setting a default to your card so you don’t have to tap off when you get off the train. Keep your ticket, pass, or PRESTO card handy for fare inspection while you ride the train. Buy your ticket before you board the bus and show it to your driver. *Ticket vending machines at Long Branch, West Harbour, Oshawa Bus Terminal, Mimico, and one machine at Bloor, do not accept cash. Trips that start within four hours of the time a ticket is purchased. Equivalent to buying two one-way fares within the same fare zone. Valid on the day of purchase only; cannot be purchased in advance. To make extended travel easier, VIA Rail passengers can purchase a ticket for most connecting VIA and GO train trips at select VIA stations, online at VIA Rail, or by calling 1-888-VIA-RAIL (1-888-842-7245). The information below is about buying a GO ticket or pass. If you’re using PRESTO, visit our PRESTO page to learn more. Senior single-ride fare is half the adult single-ride fare. There are no discounts for a Day Pass. Eligible students using PRESTO can get a discount on their GO fare. Use the fare calculator here to see the fares. Students must see a Station Attendant or visit a Customer Service Outlet to have a “Student” setting added to their card, along with the expiry date for that setting. Students must travel with and show their school-issued ID card for fare inspections. Learn more about getting and using Student ID. Students must carry GO approved Student ID to show for fare inspections. Maximum of five people travelling together. At least one, but not more than two, members of the group must be aged 18 or over. Members of the group do not have to be related. Unlimited travel on one day between two specified fare zones. Group Pass customers won’t be eligible for discounts on local transit to and from GO stations and terminals. Leaders of a group of 20 or more children 12 and under should contact us at 1-888-GET-ON-GO (438-6646) at least 24 hours in advance to arrange, if space is available. Contact us at 1-888-GET-ON-GO (438-6646) at least 24 hours in advance to arrange, if space is available. Single-Ride tickets or Day Passes are sold on the day of travel only, and groups must be at the station at least 30 minutes before the scheduled departure time. Large Group Pass customers won’t be eligible for discounts on local transit to and from GO stations and terminals. Buy your ticket at the ticket counter and your support person can get a Support Person ticket. If you use PRESTO, ask for a Support Person sticker to be put on your card at the ticket counter. We promise to do our best to be on time; however, sometimes delays happen. If your train arrival is delayed by 15 minutes or more, we want to credit what you paid for the trip. Some conditions apply. Visit our Service Guarantee page for more information or to make a claim. Visit our Getting to GO page to learn more about the discounts available on many local transit systems we connect with. You may be eligible for a tax credit. For more information about PRESTO and the public transit tax credit, visit prestocard.ca. Every year on November 11 and for the Warriors' Day Parade at the CNE, we honour the men and women who have served to protect our country by offering free GO transportation for veterans, their companion and currently serving members of the Canadian military. Veterans and currently serving members of the Canadian military are asked to identify themselves by wearing their medals, beret, blazer, uniform, or other similar belongings while travelling. Immediate family members of deceased veterans may also ride for free if carrying something to identify their relations to the late veteran, such as service papers or an identification card.